[S739] Chicago Tribune, October 23, 1949, Pag 32, Accessed November 3, 2006, ProQuest, Chicago Tribune Historical Archives. 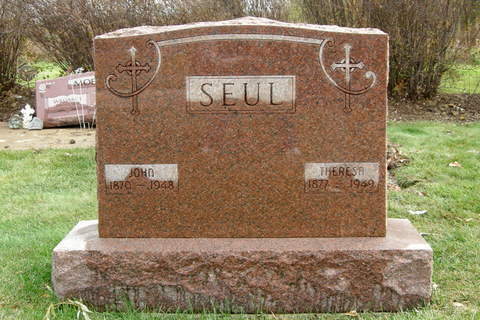 [S1274] John Seul Cemetery Record, St. Mary Cemetery, Techny, Illinois, Grave stone read by Elaine M. Beaudoin, November 3, 2010. [S750] 1930 US Census, Illinois, Cook County, Northfield, Washington, DC, ED 2238, Page 3A, Accessed November 7, 2006; Ancestry.com. [S1005] 1930 US Census, Illinois, Cook County, Chicago, Washington, DC, ED 1177, Page 10A, Ancestry.com, accessed November 16, 2006. [S1002] U. S. Social Security Administration, Ted P. Parpan, SS# 334-20-9675, accessed November 16, 2006. Note*: Theodore Parpan Parpan is a common surname in Graubunden. Etymologically "Parpan" originates from the French partis-pain, meaning "bread-deliver" Source: Wikipedia. [S1006] Illinois Statewide Death Index (1916-1950), Certificate # 6011171, file date April, 10, 1949. [S1443] Chicago Tribuen, December 6, 1940, page 22, ProQuest, accessed December 30, 2011. [S1978] Ancestry.com Family Trees, online www.ancestry.com, Parro Family Tree_9_1..., created by dparro09, Donald Francis Parro Sr., entry, accessed March 26, 2019. Dr. Earl D. Parro, beloved husband of Genevieve Colby Parro, fond father of David, Donald, Richard, Robert, Vincent and William, devoted son of Elizabeth and the late David, brother of Raymond, vincent, Milton, and Helen Parro and Mrs. Marian Hagen. Funeral Saturday, Dec. 7, 9:30 a.m., from residence 8133 Champlain avenue, to St. Clotilde church. Burial Calvary. [S1442] Chicago Tribune, March 29, 1968, page C14, ProQuest, accessed December 30, 2011. [S2311] Paslay-Connor marriage license, no. 9584: California, County Marriages, 1850-1952; FamilySearch.org, accessed April 14, 2016. Book 808, Page 222. [S2644] Arthur L. Pasley and Alice Connor marriage record: Accessed March 7, 2018 on Ancestry.com.